How to write a CV that gets results! I am constantly inundated with messages from people asking me to review their CV’s and provide “quick” feedback. It is truly an honour that people put this level of trust in me. In order to help as many people as I can for free, this blog post contains my top tips to improve your CV/Resume. Please note that these are broad guidelines, remember to take into consideration your industry and country specific nuances. In this post, I address; guidelines on CV length, what to put in your biographical section, what a career summary (career objective) should contain, how to make your CV stand out by using high impact statements, and finally what to put in your CV if you have limited or no experience. If you are an entry level professional i.e. have less than two years experience, your CV should be a maximum of two pages. 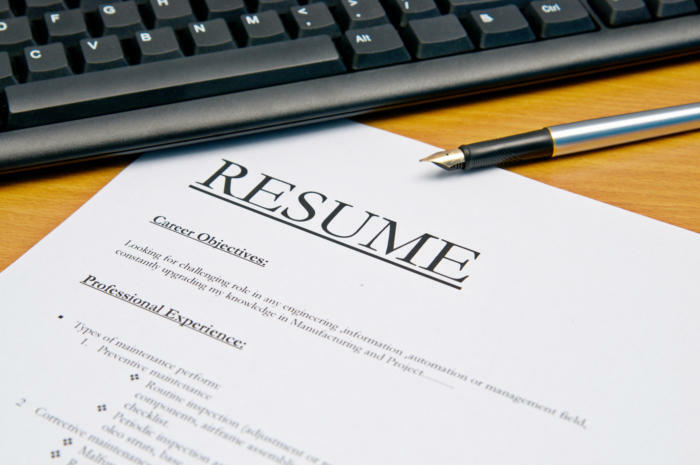 If you are an experienced professional, ideally your CV should not be more than three to four pages long. Recruiters do not have time to read long documents, especially during the initial screening phase. Experience (if your education is limited or your experience is more impressive than education, I advise listing experience first and education at the end). I personally like a Career Summary at the beginning of a CV. This is in place of what I believe to be the now redundant Career Objective. 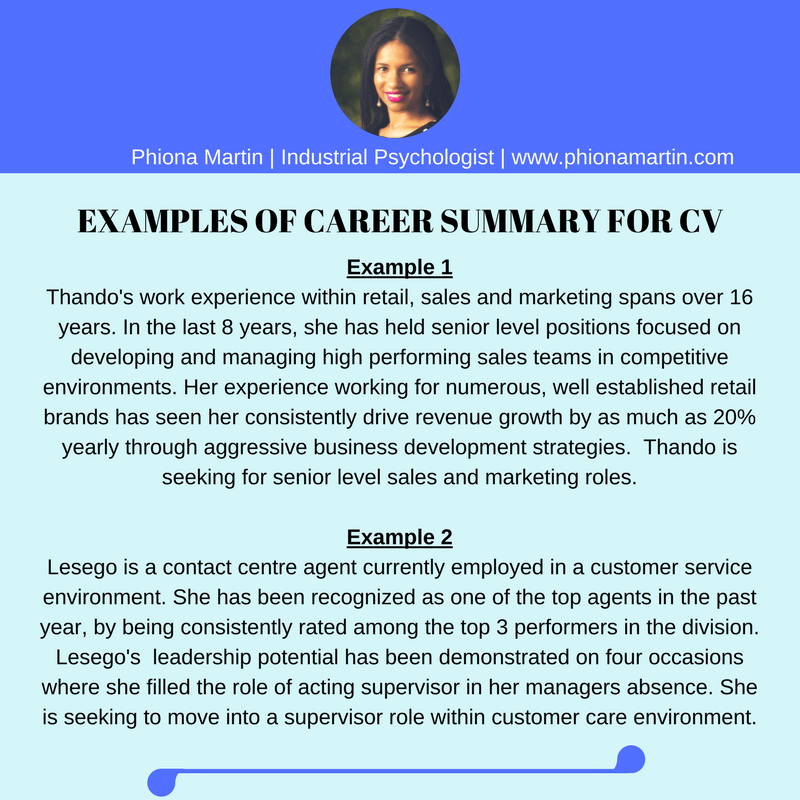 The career summary is a brief but powerful tool that summarises your experience and key selling points in maximum 150 words. Basically, the reader should be able to grasp who you are in those few sentences, such that if they did not read past the first page they have a fairly good idea of your entire profile. Career Summary must contain ACTUAL experience and ACTUAL achievements. Do not fill it with words like “I am reliable, dependable, self-starter, self-driven, self-motivated etc.” These cliché words mean nothing unless backed up by actual examples! See picture below for two career summary examples. You can tweak the summary to align with what you are applying for. 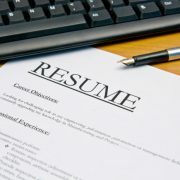 To make your CV stand out, do not just describe the job task. Take it further, mention impact and achievement if possible. Here are examples of how to turn your job tasks from Low Impact to High Impact. LOW IMPACT: Implemented a new accounting system. HIGH IMPACT: Implemented a new accounting system for multiple locations which increased efficiencies by 25%. LOW IMPACT: Handled customer calls. HIGH IMPACT: Responded to over 85 customer calls daily and resolved 90% queries without escalating to supervisor. HIGH IMPACT: Served customers in a positive way and regularly received the highest customer service ratings in the department. LOW IMPACT: Ran social media campaigns. HIGH IMPACT: Created a multi-media campaign that increased social media engagement for the company by 120%. What should be in the Biographical section? 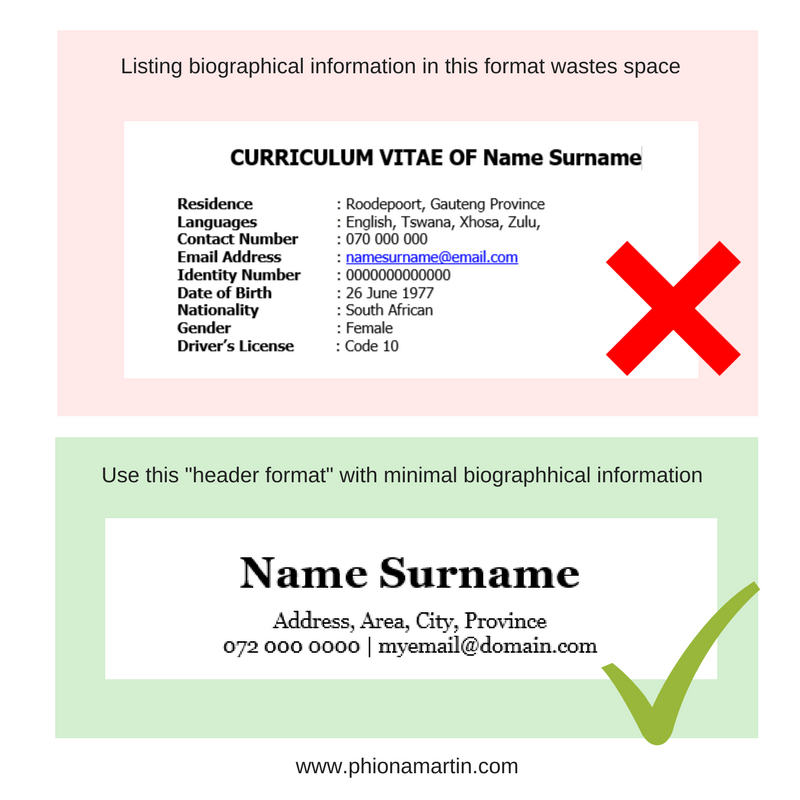 In the spirit of shorter CV’s, I recommend you put your biographical info in a “header format” as shown in the picture below. Marital Status (an example bias is married people are “more stable in a job” than single people. Or being married female will make you less flexible for long hours). Number of kids (potential bias is kids will bring many work-home conflicts making you less flexible for long hours). Only put any of the above information if it is of benefit to you in the application e.g. its an affirmative action role for black females or a graduate program for people under the age of 25 years. I did a short video on this topic, you can watch it on this link. My last tip is for students or graduates with NO or limited work experience. 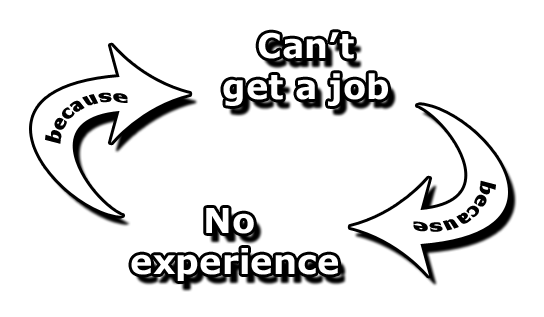 I have often come across “empty’ CV’s from young people who feel they have nothing to add because they have no formal work experience. An empty CV gives hiring managers the impression that you have not done anything productive with your time while studying. If you absolutely have none of the above, there is yet hope for you. Do a competency CV with Transferable Skills you have gained along the way that can be applied to the world of work. See example below. Research Skills: Ability to investigate problems using both quantitative and qualitative research methods. Assisted Professor in the faculty of Economics to collect data on spending habits of male students and subsequently assisted with the data analysis. Time Management: During my studies, I demonstrated the ability to deal with numerous competing demands while meeting deadlines. Through prioritization, I managed to complete my studies with a 70% average, complete 6 online courses as part of my photography hobby and conduct over 300 hours of homework assistance for my siblings. Leadership: I have been consistently nominated to lead various class projects during my studies. Through my leadership skills, I managed to motivate several project team members who were not attending meetings to actively contribute. I did this through having individual meetings with them to identify their issues and brainstorm solutions. http://www.phionamartin.com/wp-content/uploads/2018/03/resume-pic.jpg 465 700 Phiona Martin http://www.phionamartin.com/wp-content/uploads/2017/08/PM-Logo-Small.png Phiona Martin2018-04-03 03:46:592018-09-18 21:26:43How to write a CV that gets results! How to write a good CV – My feature on The Career Podcast Secrets to applying for a job you’re under-qualified for!